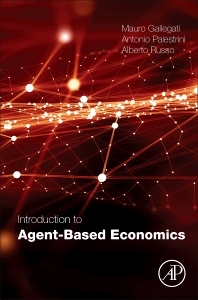 Introduction to Agent-Based Economics describes the principal elements of agent-based computational economics (ACE). It illustrates ACE’s theoretical foundations, which are rooted in the application of the concept of complexity to the social sciences, and it depicts its growth and development from a non-linear out-of-equilibrium approach to a state-of-the-art agent-based macroeconomics. The book helps readers gain a better understanding of the limits and perspectives of the ACE models and their capacity to reproduce economic phenomena and empirical patterns. 1 Decentralized Interacting Macroeconomic Models and the Agent Based "Modellaccio"
Mauro Gallegati is Professor of Economics at the Polytechnic University of Marche, Ancona. He earned his Ph.D. in Economics at the University of Ancona and has been visiting professor in several universities, including Stanford, MIT, and Columbia. His research includes business fluctuations, nonlinear dynamics, models of financial fragility and heterogeneous interacting agents. Mauro Gallegati is well known for his widely-cited work with Joseph E. Stiglitz, developing a theory of asymmetric information with heterogeneous agents. He has published papers in major journals in economics, economic history and history of economic analysis, nonlinear mathematics, complexity, and econophysics. Antonio Palestrini is an Associate Professor of Economics at the Università Politecnica delle Marche, Ancona (Italy) where he obtained his Ph.D. in Economics. He was a vising post-doc at the University of Madison – Wisconsin (1999); a visiting scholar at the Department of Economics – University of Technology, Sidney (AUS) where he collaborated with Carl Chiarella (2001), and a visiting scholar at the Brookings Institute, Washington DC (USA) where he collaborated with Robert Axtell (2006). His main research interests are business cycles, industrial dynamics, financial fragility, and mathematical finance. He published in international journals such as "Journal of Economic Behavior and Organization," "Ecological Economics," "Macroeconomic Dynamics," "Journal of Economic Dynamics and Control," "Economics Letters," and "Information Sciences." Alberto Russo is Assistant Professor in Economics at the Università Politecnica delle Marche, Ancona (Italy). He obtained his Ph.D. in Economics from the University of Pisa. His research interests include agent-based macroeconomics, financial fragility and systemic risk, social classes and distribution, and experimental economics. He published in recognized journals such as JEDC, JEBO, and JEIC. He is Associate Editor of "Complexity Economics." He is also a member of the INET task force on macroeconomic externalities led by J.E. Stiglitz.